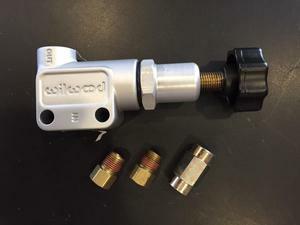 This remote adjuster knob and Wilwood brake bias proportioning valve allows you to adjust your brake balance on-the-fly from the driver's seat! This remote adjuster knob pairs with our Wilwood brake bias proportioning valve to allow you to adjust your brake balance on-the-fly from the driver's seat! 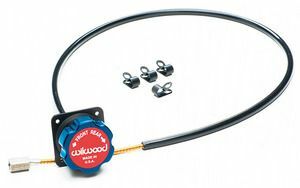 This remote adjuster knob and Wilwood brake bias proportioning valve allows you to adjust your brake balance on-the-fly from the driver's seat! Includes an adjuster knob with mounting plate that you can mount anywhere in the interior, extension cable to run from the prop valve through the firewall to the knob in the interior, and clips to hold the cable in place. Note that install requires removing the existing knob on the prop valve to thread on the extension cable. This plastic knob is threaded on to the valve with a little loctite, so we use a small dremel to cut the knob off without damaging the threads.